It’s a tough break to take a fun-as-hell product - a beer brewed with hemp - and have to, ahem, blunt its edges. The law stipulates the label on any hemp product for consumption shalt not contain an image of any part of the hemp plant other than seed, make reference to any psychoactive effect or include the word cannabis, marijuana or any words with similar meaning. After several knockbacks on our Hemp IPA label, Afends and Young Henrys commissioned artist SUDS to create his playful FUN POLICE graphic - a cheeky dig at the endless regulator hoops we jumped through that still manages to colour within the lines. After all, a sick picture’s worth a thousand different words for weed. Inside, it’s a crushable, great-tasting hemp and hop high-five, with no added novelty. 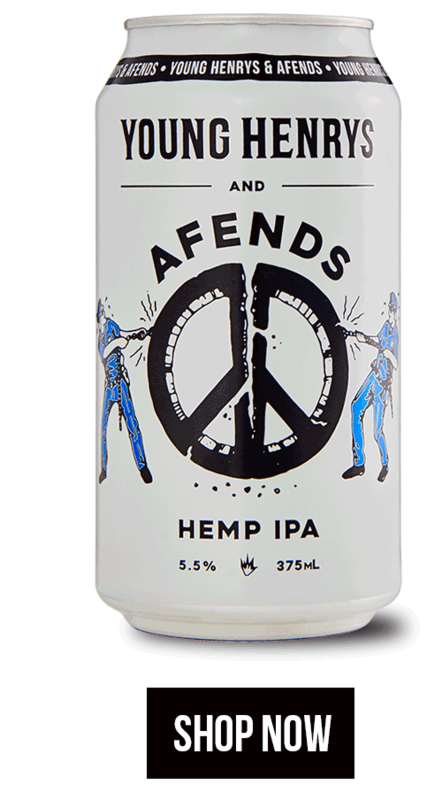 The Young Henrys and Afends HEMP IPA is a big sticky number with a dank aroma of citrus, tropical and stone fruits with some spice berry. Biscuit and toasted bread flavours bring balance to the resinous vegetal notes from hemp oil and hop hash. A high-wire act, on the edge but totally in control, delivering flavour and sessionability. PLEASE NOTE: This product is very limited. Might be a good idea to call your local bottle-o before heading over there, just to make sure it's in stock. If your local isn't on the map and could use a little Afends Hemp IPA in their lives, feel free to shoot them our contact details. Email info@younghenrys.com or call us on 02 9519 0048.